Happy Monday. How’s your week starting off? I’m so glad that the conference I was at last week only went through Saturday, as I definitely needed Sunday to recharge and get set up for the week ahead. This one is packed. Since I had plans for some late-morning Zumba, I didn’t want to eat too early and be starving in the middle of class, but I also didn’t want to feel weighed down by a huge breakfast. So, after running some errands and doing a little food prep for the week, I made a new savory oatmeal concoction that definitely bears repeating. It was the perfect mix of proteins, fats, and carbs to get me through an hour of dancing/laughing at myself. Black garlic is a fermented product that’s very mild, smooth, and a little sweet. You can eat it spread on bread, blended into sauces, or cooked into all kinds of dishes. It’s a great way to bring together sweet, salty, and umami flavors. I just get mine at Trader Joe’s but if you can’t find it near you, just sub roasted roasted garlic. Whisk together black garlic, miso, sesame oil and water or process in a food processor until smooth. Set aside. Heat olive oil in a sauce pan or skillet. Sauté shallot until translucent. Add scallion and cook until soft. Add shiitakes. Cook until soft. Meanwhile, cook the oats, flax, sea salt, and water either in the microwave (~2 minutes) or on the stove until liquid is absorbed. Stir a spoonful of the black garlic paste into the oats until incorporated. Top with half the mushroom mixture and a poached egg. What does two glasses of wine do to you? Any favorite breakfasts lately? This entry was posted in Uncategorized and tagged black garlic, cooking, recipe. Good morning and happy Saturday! I’m off to my last day at the conference and am looking forward to some great lectures. Can you believe we’re in the last week of February? We’re also only 4 weeks away from the official start of Spring! Looking ahead to the coming season, I thought it would be fun to hear from you guys. I’d love to feature a few guest posts in the last weekend in March. Send me an email at keepingitrealfood(at)gmail(dot)com if you’re interested! This entry was posted in Uncategorized and tagged conference, guest post, spring, winter. 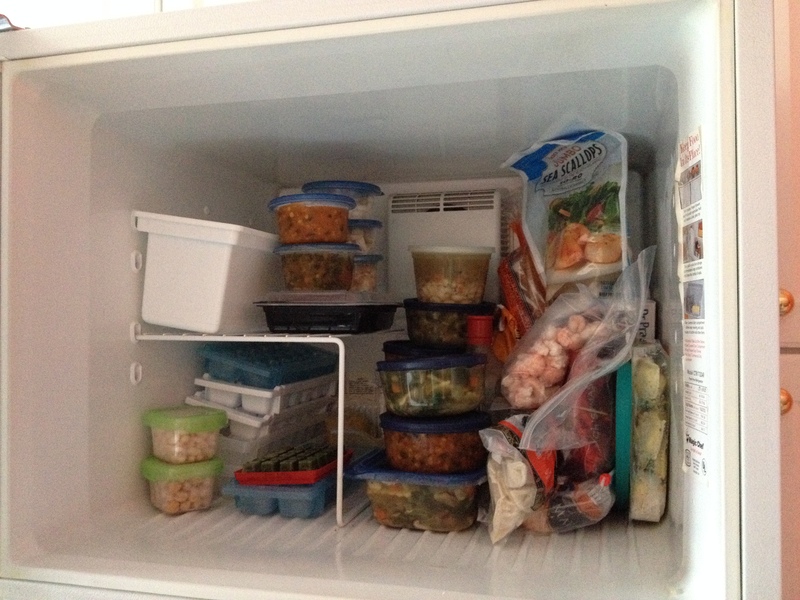 So basically, lots of frozen soup, frozen fish, frozen beans, frozen sprouted grain bread, and frozen vegetables. No wonder Whole Foods sends me coupons more befitting a family of four instead of, well, one. What’s in your freezer? Who were your favorite musical artists at age 18? 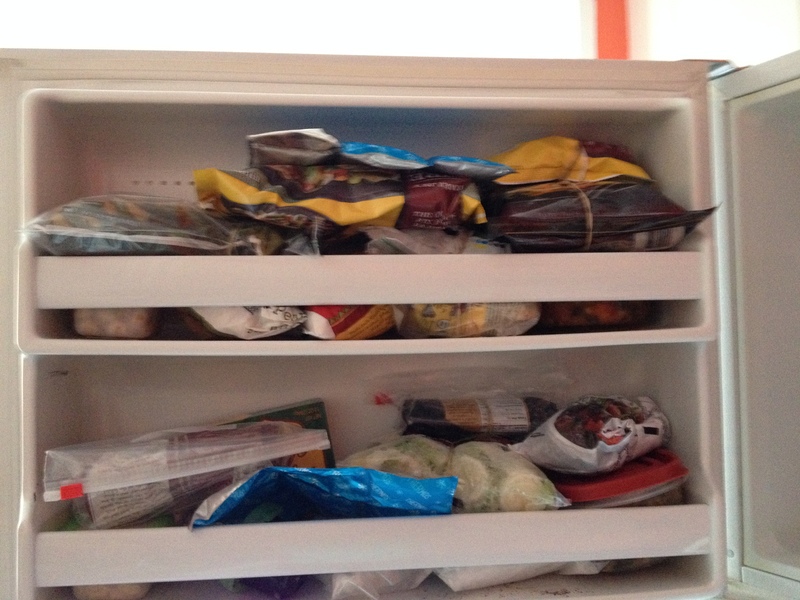 This entry was posted in Uncategorized and tagged cooking, freezer, kitchen, music David Bowie, nutrition, shopping. I’m happy to be nerding out for a few days this week at an integrative healthcare conference. I strongly feel that utilizing a combination of conventional and alternative practices is the best way to provide individualized care. When it comes to nutrition, there is a lot of talk around herbs, supplements, and therapeutic diets, but there’s also discussion around biological, psychosocial, and neurological factors at work on our health. Food is perhaps our oldest form of medicine—all the more reason to ask lots of questions and do your homework when it comes to “natural” and “holistic” supplements and treatments. Stuff that grows in nature is powerful! So far, I’ve been to some interesting lectures on menopause and on food cravings, and I have a bunch of other fascinating topics to look forward to. I love this stuff. Another treat I’m enjoying this week: the long lunch break. 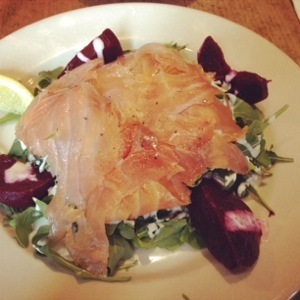 It almost felt like I was on vacation when I sat in Le Pain Quotidien and enjoyed this smoked salmon and beet salad at a snail’s pace! I can’t remember the last time I ordered coffee after lunch instead of with the meal. At least not on a weekday! what do you nerd out on? I can’t believe today is my 150th What I Ate Wednesday post. What’s especially crazy about that is I don’t think I missed many—if any weeks. Out of 150. And neither has the lovely host, Jenn of Peas & Crayons. I love that one blogger was of getting a look at what she was eating turned into a fun weekly link party. If you want to see more WIAW from other bloggers, take a little visit on over there. This entry was posted in Uncategorized and tagged avocado, breakfast, dinner, lunch, oatmeal, salad, What I Ate, What I Ate Wednesday, WIAW, yogurt. As I’ve written about before, to keep my grocery spending in check without feeling deprived, I allow myself one impulse buy when I go to the store, if I want it. 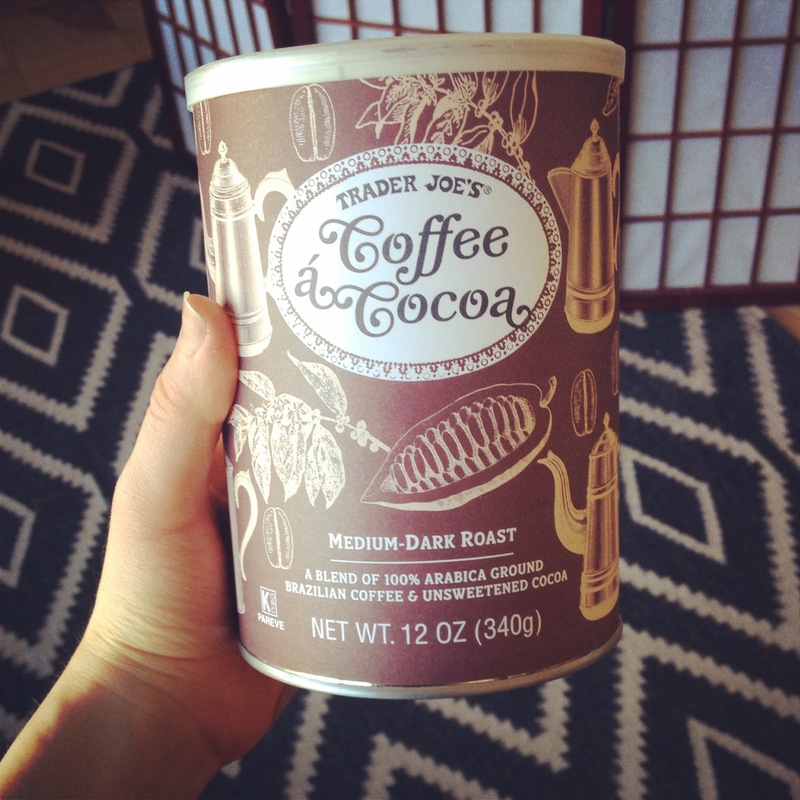 The other day while grabbing some things for the week at Trader Joe’s, I picked up this Coffee & Cocoa blend. I think I made it about twenty minutes before brewing a pot. I have one of those little 4-cup coffee makers, so a pot is really not that much compared to what most people think of as a pot of coffee, but I digress. Anyway, it was really good! The cocoa flavor is subtle but distinct. There is definitely no mistaking this stuff for hot chocolate, though—it’s more like a rich, smooth coffee with a little hit of je ne sai quois (I guess I do remember some of my high school French after all). Not bad for a $6.99 pick-me-up. Any favorite impulse buys lately? 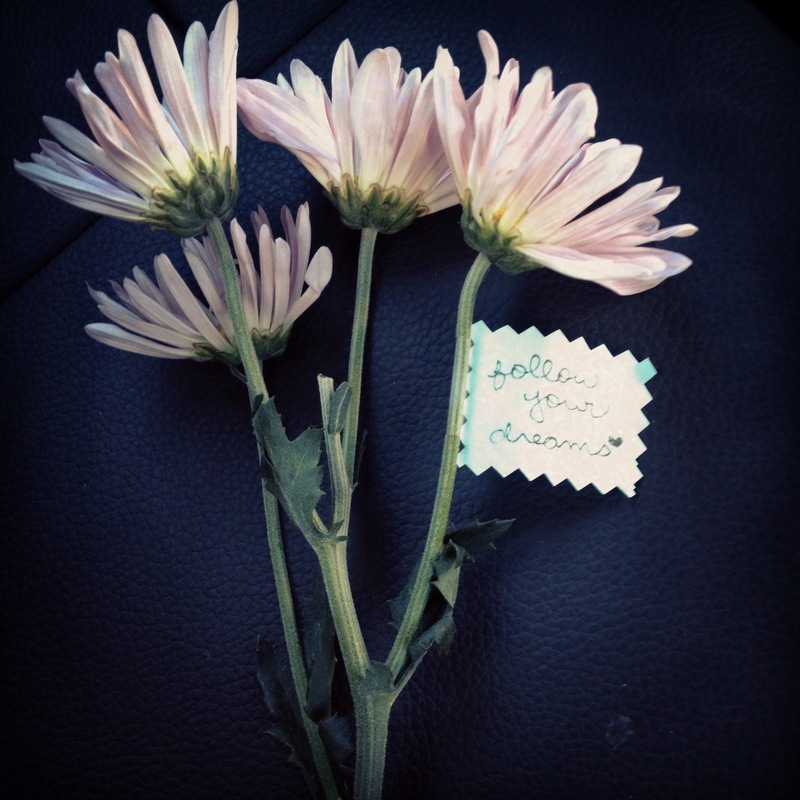 This entry was posted in Uncategorized and tagged caffeine, chocolate, coffee, Trader Joes. Sometimes I joke about publishing a cookbook of foods I make and love but would never have the balls to serve up to another human without first letting them know what they were getting into. And obtaining said fellow human’s permission, of course. However, the market’s not exactly hurting for anecdotes on solo cooking and dining behavior. Alone in the Kitchen with an Eggplant covers that territory so well. If you haven’t read this book, I’d highly recommend checking it out. Reading it a few years ago was a nice revelation that I’m not the only mad scientist out there. 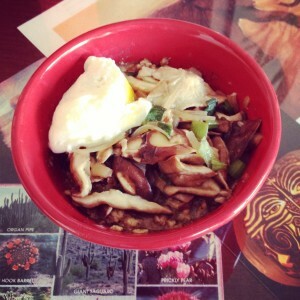 That said, l fully support the notion that savory oatmeal should become a more mainstream thing. 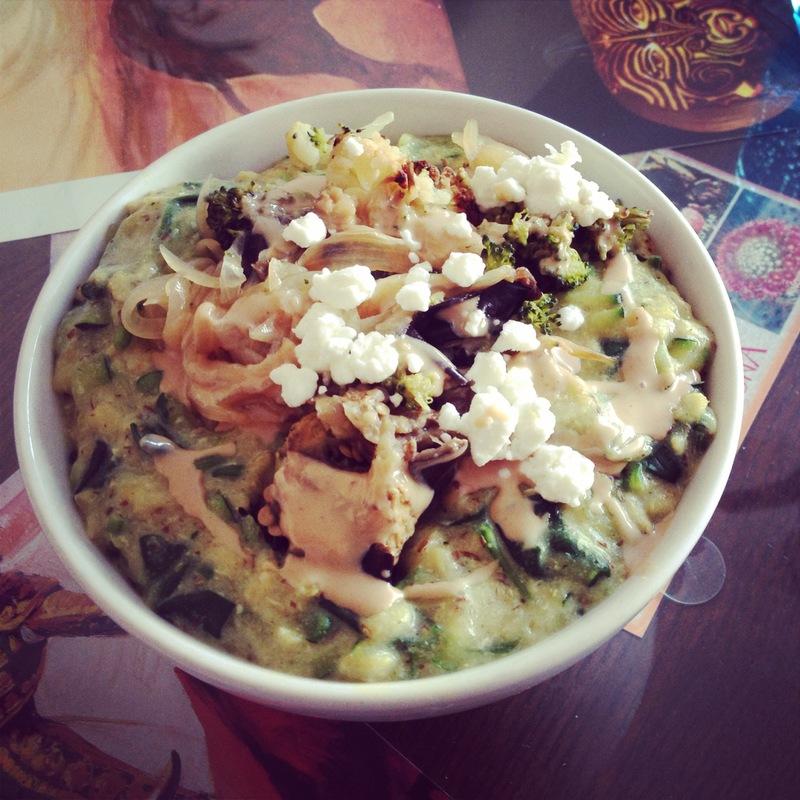 Yesterday I enjoyed a bowl of it topped with roasted veggies, caramelized onions, tahini, and goat cheese. Don’t knock it ’til you’ve tried it…Aside from being delicious (in my humble opinion), it’s a great way to get in some veggies first thing. What’s the weirdest thing you eat but would be hesitant to serve to someone else? This entry was posted in Uncategorized and tagged breakfast, cooking, dietitian, nutrition, oatmeal, savory oatmeal, vegetables.